In this episode, Kate Anderson, the lead vocalist of Winter Grain, opens up about the release of their self-titled EP. 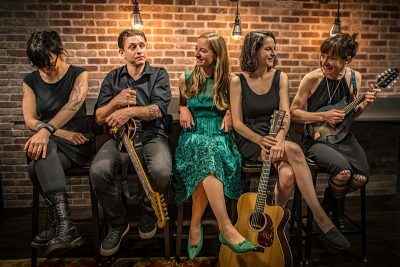 She dissects her experience working with Bear Creek Studio and shares some stories that inspired her songwriting along the way in anticipation for their album listening party on June 7. It all began at Anderson’s place in Sugar House. She and her band were throwing some ideas around, got lost in conversation and fell on the subject of recording. “The only thing we could boil back down to was going into recording,” Anderson says. “Our friend asked me where I would want to go in the dream-spectrum of things and I pointed at the wall to Brandi Carlile’s The Firewatcher’s Daughter and I said, ‘There. I think that’s the dream’.” It only took one email to Bear Creek to get them in the studio and working with in-house producer Ryan Hadlock. “Before we knew it, we were working with two grammy-award-winner studios, and we couldn’t be more pleased,” Anderson says. When the project first started coming together, Tim Neu and Anderson wrote a song that they consider one of their most authentic songs, “Solitary Trees.” After flying black hawks for a while Anderson moved to Salt Lake City to fly lakotas, “I moved here for the aircraft and it was a very lonely experience,” Anderson says, “I didn’t know anybody and I was reading a lot of old literature at the time. I read across Winston Churchill quote that said, ‘Solitary trees, if at all, grow strong,’ and I really connected with it at the time.” When it came time to work, she knew this song came from an authentic place. The episode is brought to a close with one of Anderson’s oldest and favorite songs “The Wall.” Almost cut from the EP completely, this song has a special place in Anderson’s heart. “So many influences have gone into this song across the board, and I’m glad it’s found new light in this way,” Anderson says. Winter Grain will debut at the Clark Planetarium’s dome theater on June 7 at 8 p.m., and keeping up with them is made easy via their Instagram: @wntrgrain. Thanks for listening to SLUG Soundwaves.